Make 4 payments of $266.75 over 8 weeks and get it now! ICE billet distributor featuring 6061 aircraft grade aluminium housing, hardened and precision ground 4130 chromoly shaft, high temperature upper roller bearing and oil impregnated sintered iron lower bush, triggering via Hall Effect vane sensor unaffected by dirt, moisture or vibration, generally available with the option of small or large HEI style cap with plug wire retainer. 7 Amp Street Series digital ignition box featuring-16 preloaded push button ignition curves, -MAP sensor vacuum input -Dedicated tach output. 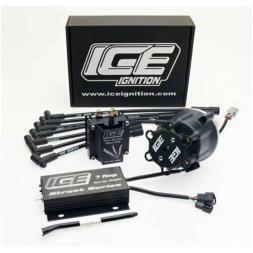 High voltage ICE Pro Series Race Coil (4200).